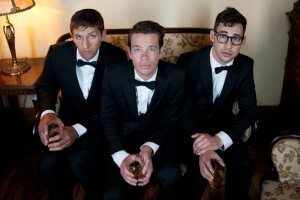 Indie-alternative-pop band fun. performed for a sold-out audience July 19 at the Mann Center in Fairmount, supporting its sophomore album “Some Nights” on the Most Nights Summer Tour. With anticipation hanging heavy in the air, fun. played a knockout, killer set. Even from high up in the nosebleed section, this show was not to be missed. Photo Courtesy The Claire Garvey Team. Fun. played to a sold-out crowd at the Mann Center July 19 with opener Tegan and Sara. The band performed songs from their touring album, “Some Nights,” closing the show with the title song. The warm-up act for the Most Nights Summer Tour was the indie-rock, synth-pop band Tegan and Sara. Tegan and Sara’s set was incredibly heartfelt and genuine. The singer-songwriter duo, who happen to be identical twins, started touring after graduating high school in Canada in 1998. Tegan and Sara played for nearly an hour and clearly could have kept playing for longer. Their songs about the elusive nature of love and heartbreak were moving. Of course, they played their single “Closer,” among many others. No doubt, they did a great job warming up an excited crowd. Finally, after too many agonizing minutes of waiting, the crowd began to cheer. Three very handsome and sharply dressed men donning suites and bow ties spilled onto the stage. Nate Ruess, fun.’s lead singer, promptly and quietly began to chant the theatrical “Some Nights (Intro),” the leading track from their touring album. The haunting melody quickly climbed from poignant and satirical to the grand finish, and off came the band’s suits in favor of more “fun” clothing that was trendy and urban. I’d be hard pressed to choose a favorite song or moment from this show. Fun.’s wit brilliantly shone through its handcrafted and complex tunes. Additionally, the group took many opportunities to connect with the audience. Ruess nostalgically recalled how one of their first shows ever was played at a bar in Philadelphia, to which the crowd responded by cheering wildly. He then mentioned that the Mann Center is the largest venue they have headlined thus far in their career, which gave way to more cheering. Later on in their set, after Ruess made mention of his hailing from Arizona, guitarist Jack Antonoff shared that he is from right over the river in New Jersey and that this is the closest he gets to a hometown show. It was then divulged that both Antonoff’s and keyboardist Andrew Dost’s parents were in the audience. What proud parents they must be! The energy level of fun. was simply indescribable. At one point, during a snippet of Gary Glitter’s “Rock and Roll Part II,” confetti was strewn across the stage. Ruess playfully rolled around in it and ended up with confetti stuck to his face. Antonoff got in on the action too, so much so that I was concerned he was going to smash his guitar. Thankfully, no guitars were harmed during the performance. The encore for the night was the infamous “Some Nights” which had the crowd gleefully singing along, followed by a 12-minute rendition of the song “Stars,” complete with horns. Philadelphia was the seventh stop on the Most Nights Summer Tour. Fun. will be touring through September, and I highly recommend going to a show, but, only if you like having fun.